Eley Metrology can calibrate and resurface metrology standards such as surface plates, tables and parallels. 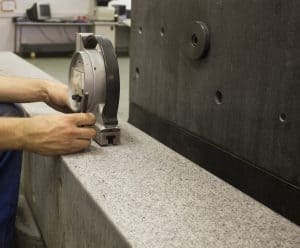 Our highly skilled engineers will hand-lap your granite back to the original specification or scrape and machine your cast iron back to grade. This service can be carried out at our certified UKAS laboratory at Eley's Derby Headquarters, or for larger tables this can be undertaken at the customers premises in order for the least disruption possible to occur to your business.